I left Los Alamos around 6pm on Thursday evening en route to the Huerfano TH where I'd meet Aron. The forecast for the Sangres wasn't very positive-something about 60 percent chance of showers on Friday and a 50 percent chance of showers on Saturday with moisture trapped in the atmosphere. Having been hailed off (with plenty of lightning!) the weekend prior on a foray in the Sangres, I wasn't optimistic about the weekend's potential for success but I hadn't seen Aron in a long while and often one can get lucky with the weather so I headed out anyway. On the way I phoned in my order for a green chile cheeseburger at Blakes Lotaburger in Espanola making for a fast and very tasty New Mexican dinner on the road. This was also my first road trip in my new used 2002 Honda CR-V. I hoped it would do well up the Huerfano TH road. The Huerfano TH road was plenty wet with one area of the road actually in part of a large beaver pond and another section rutted out with streams running in each rut. But despite this, the CR-V did fine all the way to the end of the road at 10,660'. Aron pulled up about 10 minutes after I got there, I pitched my tent in the parking area and we slept. We awoke at 4am and packed up our bags. For Ormes we carried a 60m 9.8 rope and a moderate rack of small to large nuts, small to #2 BD camalots and 10 runners. Aron would switch into climbing shoes while I would hike and climb in my Montrail D7 approach shoes. 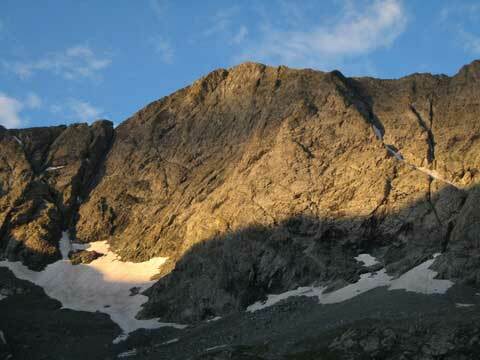 We left the TH at 4:45am just after a couple of hikers headed to Mount Lindsey passed by. The Huerfano cruises pretty quickly but we inadvertently crossed the Huerfano River about 20 minutes into the hike where we should have stayed on the right (west side) of the river on good trail. We quickly realized our mistake and headed cross country back across the river to past the main, low trail and more cross country uphill to catch the Lily Lake trail towards the buttress. The valley was very lush and all the vegetation was heavily loaded with moisture so our pants and shoes were soaked in no time. At 11,600' the Lily Lake trail switchbacks sharply to the north and we left the trail here to cross talus to the base of the buttress at 12,400'. On the way Aron found a bighorn sheep's horn and stowed it away. A pretty cool find! The Ormes Buttress starts at the low point of the wall just right of the large snowfield and heads up to the ridge crest a couple hundred feet below the summit. Snow at the base of the buttress kept us slightly to the left of the buttress' crest and we donned our harnesses. At 7:30am we set off up the buttress unroped at based on descriptions calling the first section 4th class. 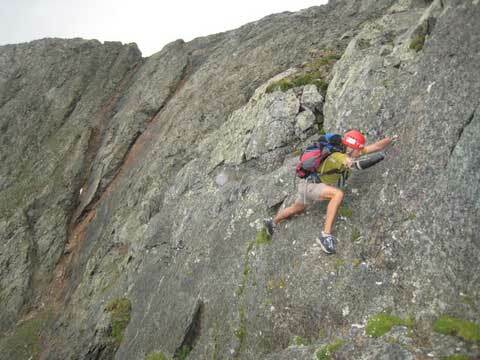 With me in the lead with the rope on my pack, we quickly got into some dodgy 5th class climbing on loose, slopey rocks. We worked back and forth down low for a bit looking for easy passage up but never found anything super reasonable for uproped climbing. On sloping ledges at the start of the climb. I got to a point that made for a decent belay area and tossed the rope down to Aron. However, Aron had the rack so I had no anchor. He tied a few cams and nuts to the rope and I pulled them up to establish an anchor. Once setup, I tossed the rope back down to him and belayed him up. Above us was a way sweet 5.6ish right-facing corner that I was excited to climb. I led up this corner which offered fantastic laybacking with great feet. Sadly, this goodness only lasted for about 80 feet and then I found myself in actual 4th class climbing. When the rope came tight, Aron started following me as we simul-climbed up for about another 150 feet where I setup another belay and brought Aron up. 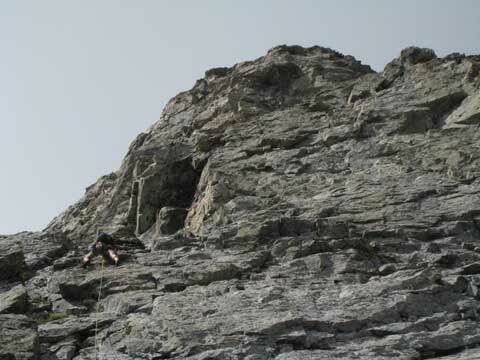 From here, Aron took the sharp end and led up fourth and low-fifth-class terrain for a few rope lengths as we simul-climbed. We stayed, for the most part, on the left side of what I'd consider the buttress crest and never found anything harder than 5.4ish and even that was very occasional. The scrambling and climbing was very enjoyable on the mostly-solid rock. The position on this impressive wall was awesome! Looking down the buttress to the talus sure looked spectacular! Aron leading up about half way up the buttress. About 300 feet below the ridge crest, Aron setup an anchor and brought me in. Looking up we saw more fourth and low-fifth class climbing to the ridge. I again took the lead working us right towards the buttress crest to make the climbing a bit more interesting. A couple of steep sections made for a fun challenge at altitude until I reached a nice ledge just below the ridge crest and brought Aron up. On easier terrain near the top of the buttress. Until now, the day had been surprisingly nice but clouds were now swirling over the ridge from the Lake Como basin and the surrounding clouds began to look ominous. 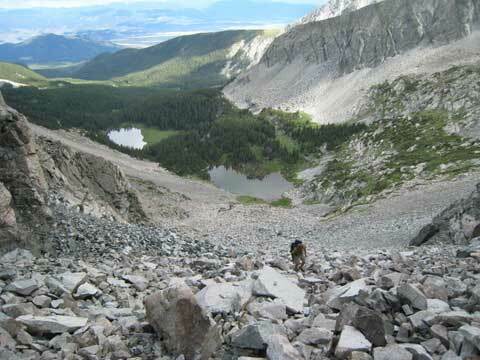 The final ridge scramble to the summit with the Huerfano valley serving as the beautiful backdrop. 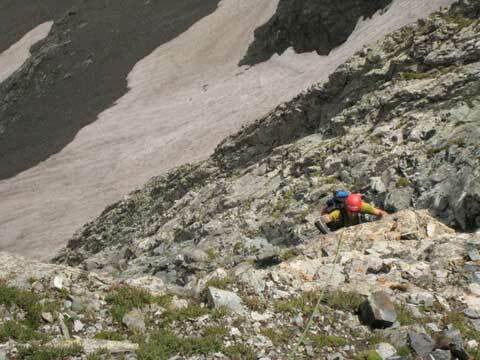 We unroped and scrambled up to the ridge and then up to the summit of Blanca at 12:30pm. The summit register can was snapped in half and the register nowhere to be found. 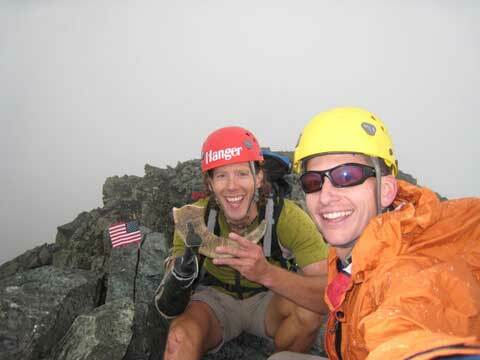 As we took a couple summit photos it began to rain and then hail. Aron proudly displays his ram's horn on the summit of Blanca. We had discussed, briefly, our descent options and decided that the north ridge of Ellingwood and Gash Ridge didn't seem prudent considering the weather so we opted for Roach's variation 20.2V descending the south ridge of Blanca towards Hamilton Peak, down to the Winchell Lakes and then up and over the low point on Gash Ridge back down into the Huerfano valley. The trail on the ridge was surprisingly well-defined and we made fast time down. As we descended the weather perked up and decided the ridge scrambling was fun enough to warrant a jaunt out to Hamilton Peak before we headed back to the cars. This ridge was a blast! Solid rock, sweet exposure and good footing made for a wonderful ridge scramble for nearly two miles to Hamilton. 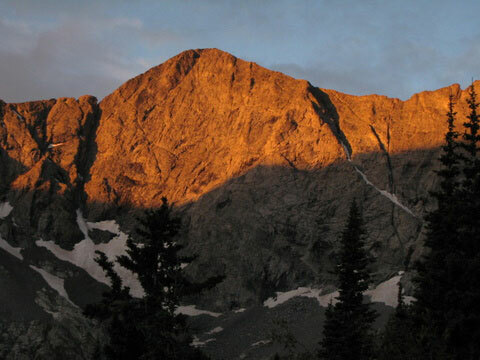 Hamiliton Peak, 13,658', is the peak on the ridge in the shadow on the right. We were able to stay in the ridge crest proper for almost the entire time and reached the summit of Hamilton around 2:30pm. 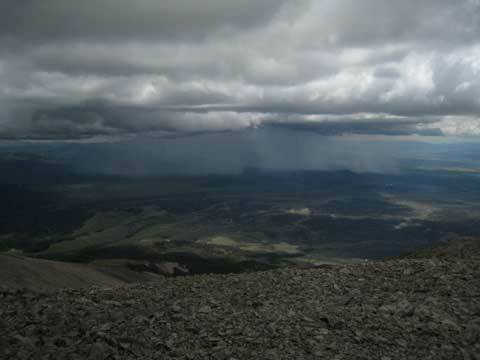 However we could see a big downpour of rain south of us that appeared to be moving our way so our time on Hamilton's summit was short-lived and we cruised back to the 4th class slabs descent area down to Winchell Lakes. The downpour to the south that would soon greet us. Just as we hit the slabs area, it began to rain in earnest. Wet slabs aren't awesome but we managed to get down to the lakes without incident. Fourth class slabs (in the rain) on the descent to Winchell Lakes. 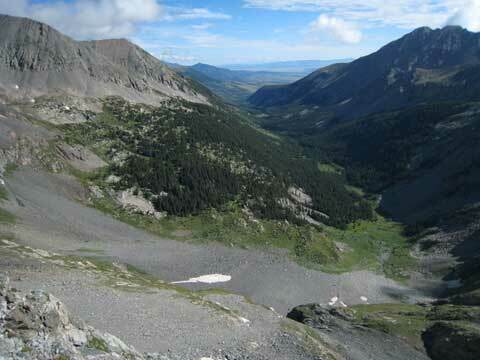 The sky again cleared as we passed the lakes and made the traverse over to the low-point on Gash Ridge. We reached this low point around 4:45pm. 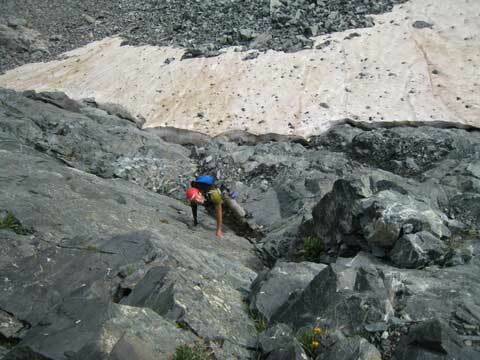 Ascending the talus to the low point on Gash Ridge on our return. As we descended down into the Huerfano valley we looked in awe at Blanca's awesome northeast face and picked out our line up the buttress. The descent on steep talus, grass and some loose rock was a bit tedious but once we hit the good trail in the valley floor we made great time back to the trailhead at 6:30pm. 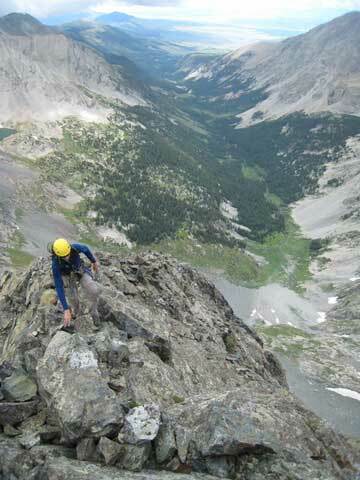 We changed out of wet shoes and socks and drove out en route to the South Colony Lakes TH for a shot at the Ellingwood Arete route on Crestone Needle the next day. 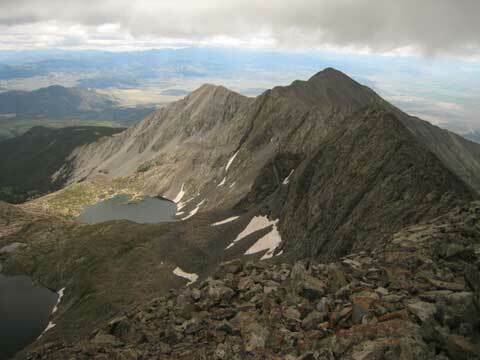 Written by Jason Halladay on 29 July 2007 for TheMountainInstitute.com.